Valentine's Day on February 14 is the day to celebrate love and enjoy kisses. However, over 30% of the population are the frogs that no one wants to kiss. It has nothing to do with their technique, the reason is very simple: bad breath. According to statistics, one-third of the entire world's population has chronic bad breath, also known as halitosis. Bad breath or halitosis is commonly attributed to volatile sulphur compounds (VSC) that are released when bacteria in the mouth metabolise food debris. In 90% of cases, halitosis originates in the oral cavity, although 10% of patients have bad breath due to gastrointestinal, urinary, or respiratory system diseases. Poor oral hygiene is the most common reason for bad breath, but sometimes, even those with good tooth-cleaning habits can fall victim. Dentures and braces make cleaning the teeth more challenging, and food particles missed during brushing can decay and cause odour. Conditions that cause a dry mouth may also increase the likelihood of bad breath. Saliva naturally washes the particles of food from the mouth, regulates the oral micro-environment, and keeps the breath fresh. When the quantity of saliva is reduced, bacteria in the mouth grow faster. It is no surprise to most of us that diet can also be a trigger for stinky breath. Ingredients such as garlic make your breath smell because of the sulphuric compounds they contain. Even brushing and rinsing the teeth will only hide the odour temporarily. Red meat can worsen the smell of your breath because small bits of protein trapped between the teeth may decay, creating odours. Plus, many of us find it difficult to start the day without the obligatory cup of coffee, but this aromatic beverage can result in a lingering smell. Luckily, it's temporary. Lots of us struggle with this question: “Do I have a bad breath”? How to find out whether your breath smells fresh or not? Before you start nervously analysing people's reactions every time you open your mouth, know that there are some simple ways to find out. This fun online guide may encourage you to try some serious self-checks. •	The lick test – lick your wrist with the back part of your tongue, let it dry for 15 seconds, and then smell it. This is, approximately, the smell that other people will detect on your breath. •	A halimeter – yes! Technology can help you with this issue! There are special devices, called halimeters, that measure levels of volatile sulphur compounds (VSCs) in the mouth. With a toothbrush, it is only possible to access the visible parts of the teeth, which is about 60% of their surface. Wisdom Clean Between Interdental Brushes with flexible, soft rubber sticks slide easily between the teeth, whilst the bristles massage and stimulate the gums, helping to remove plaque and food particles. Bacteria find the tongue a really friendly environment for growth. That is why it so important to manually remove the bacterial film and food debris that build up on it. The Halita Tongue Cleaner is specifically designed to reach the most inaccessible areas, including the V-shaped groove, and the sides of the tongue. The intelligent iQ+ ActiveOxi technology of ultraDEX Fresh Breath Spray is ideal for use away from the home, delivering instant fresh breath, lasting up to 12 hours. 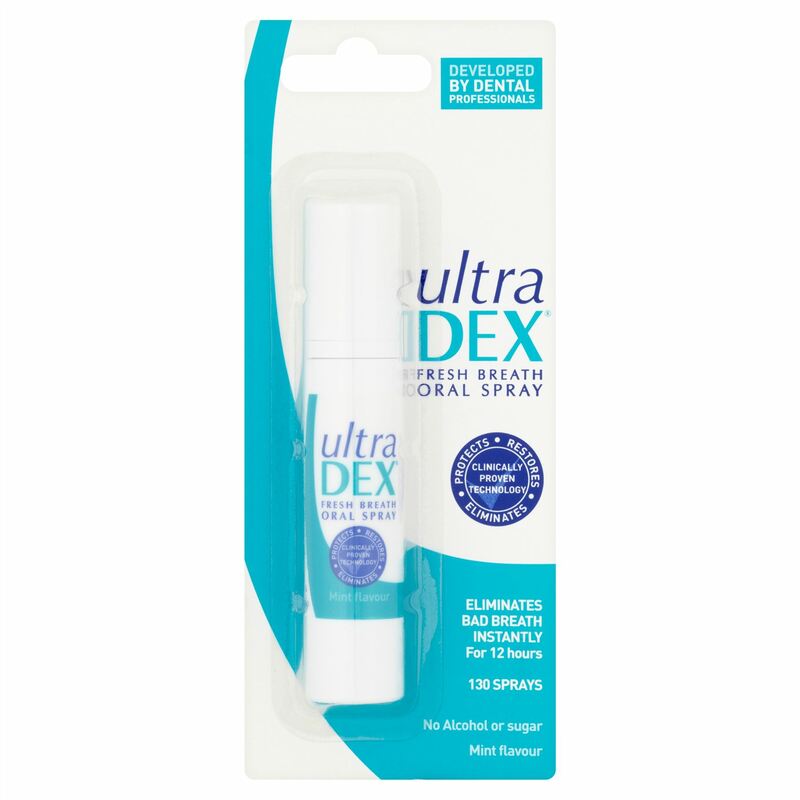 The advanced ultraDEX formula eliminates odour-causing Volatile Sulphur Compounds, and the clean mint scent gives you a pleasant-smelling mouth and the confidence to keep smiling. Dental Direct was established in 2012 by a team of experienced dental professionals. Our aim was to provide consumers with access to the most comprehensive range of superior quality, clinically-proven oral health products available in the UK. Our business has grown steadily since then, in our first year of trading we processed over 50,000 orders. This has since grown to over 300,000 orders a year, with 99.7% dispatched same day. This press release was distributed by ResponseSource Press Release Wire on behalf of Dental Direct LTD in the following categories: Men's Interest, Health, Women's Interest & Beauty, for more information visit https://pressreleasewire.responsesource.com/about.